Progress is being made on the Jean Hasbrouck roof restoration project and we need your help! Between June 4 and 15, the extraordinary timber-frame roof structure at the Jean Hasbrouck House (ca. 1721) is being repaired by seasoned professionals using historically appropriate materials and methods. This is phase one of the project to ensure this National Historic Landmark structure is preserved for another 300 years! 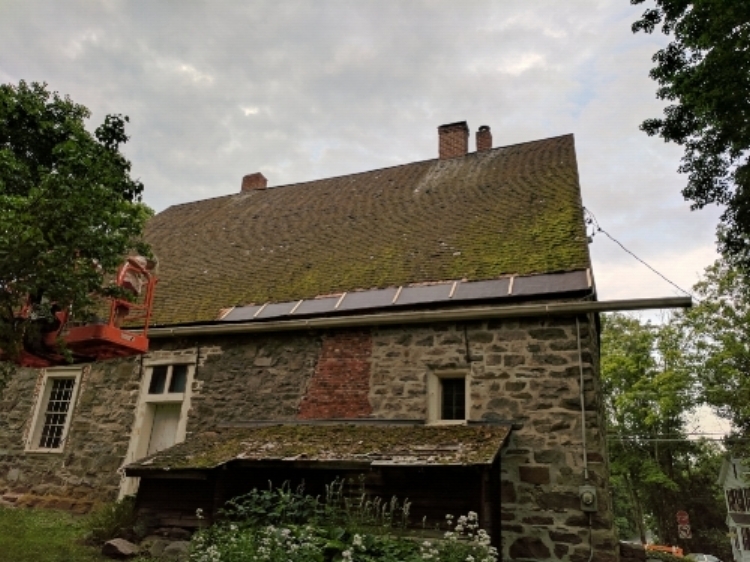 The final phase of the project will be to replace wooden shingles with shaved shakes deemed suitable for the historic interpretation of appropriate for this 18th-century house. HHS has raised more than $215,000 of the total project cost from individuals and foundations, along with contributions of historically appropriate materials from the traditional timber frame community, but must still raise an additional $120,000 to complete all phases of restoration. Please lend your support!